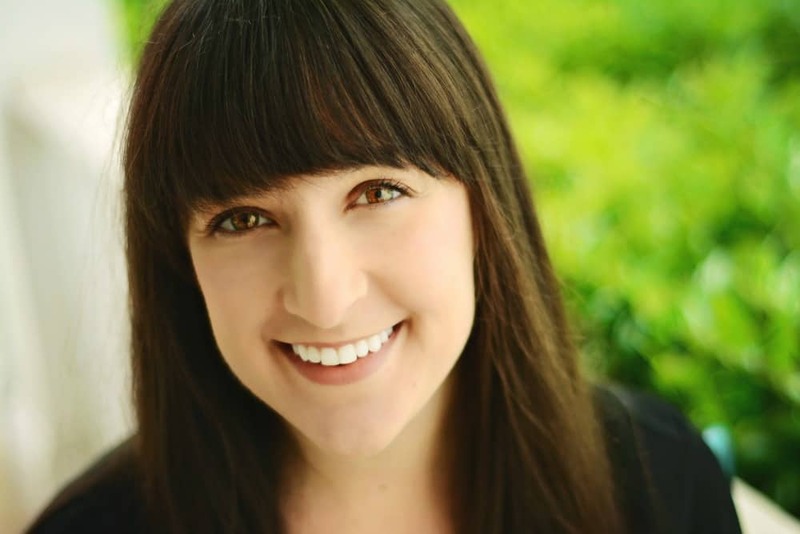 March 6, 2017 By Liz 43 Comments Note: This post may contain affiliate links. I brainstormed this smoothie while munching on Nature’s Path Love Crunch Dark Chocolate & Red Berries granola. It’s the perfect combination of delicious and healthy. (Plus the ingredients list is awesome. Everything is organic, non-GMO, fair trade… all that stuff!) 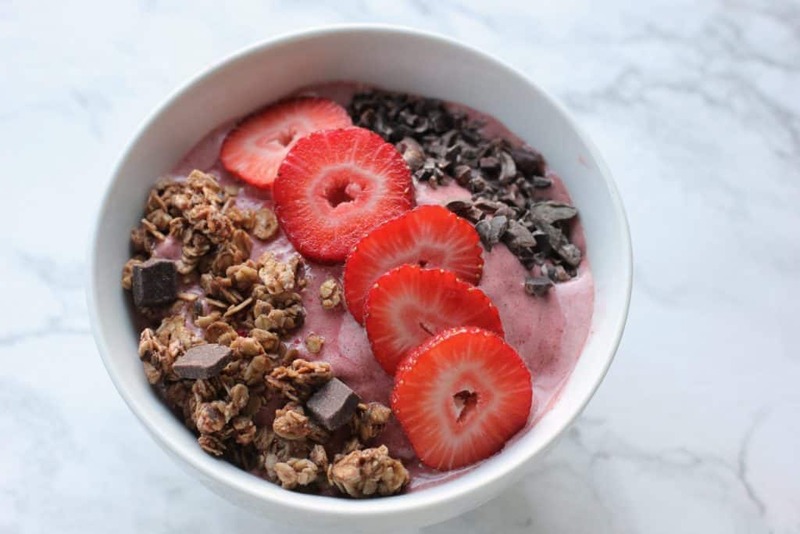 It got me thinking… why haven’t I made a chocolate strawberry smoothie bowl? Chocolate covered strawberries are one of my favorite sweet treats so it was just begging to be made in smoothie form. To get a super thick, super creamy smoothie, I recommend using frozen strawberries. That will give you a thicker consistency! If you don’t have a powerful blender, you can chop fresh strawberries, pop them in the freezer on a baking tray, then transfer to a bag once they’re frozen. The smaller pieces will be easier on your blender but you’ll still get a good, thick smoothie consistency! 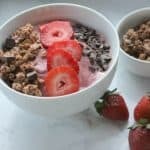 This chocolate covered strawberry smoothie bowl tastes like dessert but it’s healthy enough for breakfast! Blend the ice, strawberries, almond milk, cocoa powder, and protein powder (if using) until smooth. You’ll get a thicker consistency if your strawberries are frozen! 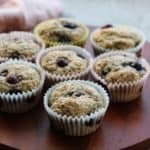 If you like it extra sweet, you can add a little stevia or sweetener. 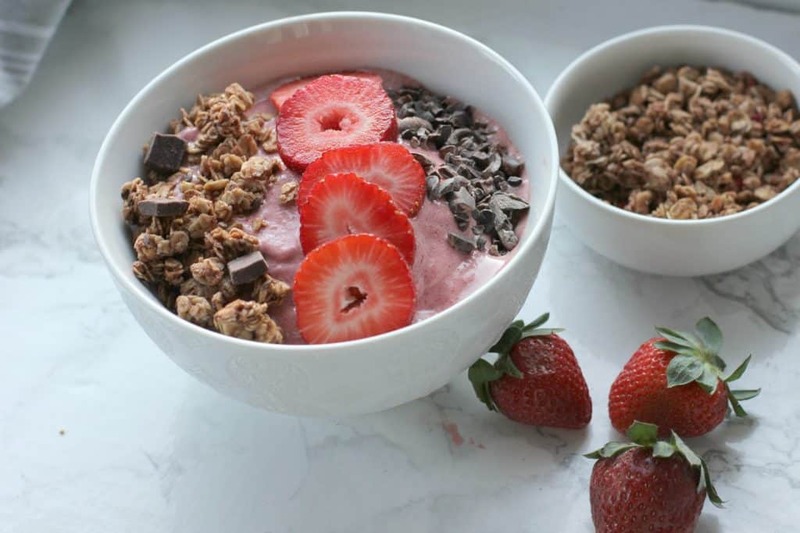 Pour it into a bowl and top with Nature’s Path Dark Chocolate and Red Berries Love Crunch granola, cacao nibs, more strawberries and/or chia seeds. If you haven’t heard of Nature’s Path, they have tons of awesome organic food options. And as if delicious food wasn’t enough, Love Crunch helps spread the love – through the Bite4Bite initiative, for every bag of Love Crunch sold, Nature’s Path donates the equivalent in cereal or cash to food banks. How cool is that? This post was sponsored by Nature’s Path. As always, I only work with brands that I truly know and love! All opinions are my own. What’s your favorite kind of smoothie bowl topping? This looks so good! 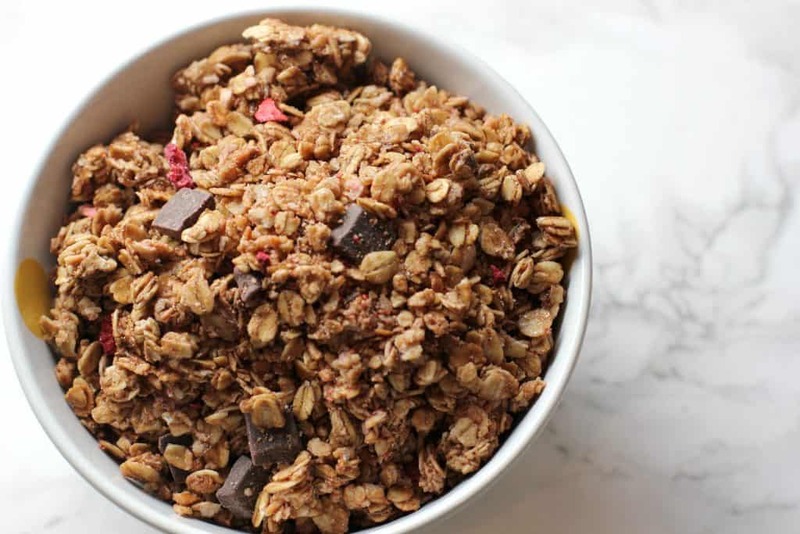 I love having little chocolate chunks in my granola, but chocolate + strawberries is even better! YUM!!! This smoothie bowl looks delicious, but adding that extra crunch is ALWAYS a major bonus…Thanks for sharing and offering this fun giveaway! Yes please…this looks too good to be true! As soon as I can eat chocolate again (Lent)…I’m all in! Ah! Way too cold for smoothie bowls right now, but psyched for the spring time! I love a good crunch so granola or nuts! Yum! That looks good! My kids love strawberries and this is a great recipe for breakfast. I need to try this. I love that stuff and almost forgot about it! Smoothie bowls are the bomb! This one is so pretty! MMMM! This is one of the yummiest looking smoothie bowls I’ve seen in a long time! Can’t wait to try the dark chocolate- my fav! Now that is a health dessert breakfast bowl! Love the dark chocolate and berry combo. Can’t go wrong there. Nature’s path is awesome! Omg i love smoothie bowls! That looks sooo good! I love granola and almond butter as my toppings. Yum! Now that sounds like a delicious granola! And yes to that smoothie bowl! I really need to have this for my breakfast this morning. So colorful and delicious and I love Nature’s Path. i really value companies that are contributing towards food bank. i will have to look for nature path’s products. Wow, this is so interesting. I’ve never thought to add those together but my breakfasts have gotten so boring lately. I’ve never tried that cereal but I am lovin’ those big chocolate chunks in there! 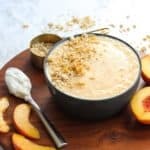 I think I’ll have to try this smoothie bowl over the weekend because I’m betting my hubby will want some too. Yum! This looks so delicious – I would love to start my mornings with this. I literally cannot buy this granola because I will seriously eat the whole bag at one time in like ten minutes. I swear. HA! Hahaha I know! I could eat a whole bag at once! That granola is my favorite! I always have a bag of it in my fridge. Ha! Pinned that bad boy recipe. Thanks. I love all the berries as my topping! YUMMY in my TUMMY! That’s my favorite granola. 🙂 I can imagine it would taste fantastic on a smoothie bowl! Great combination! A delicious organic smoothie on a chocolate crunch bowl. This looks absolutely delicious!! I gotta make something like this for breakfast sometime! Oh my! I sooo LOVE Love Crunch. I bought a big bag one time at Costco and it was half gone by the time I got home. What a great way to kick up a smoothie bowl!! You had me at chocolate. Especially dark chocolate. And then give me a healthy breakfast version and I’m done. 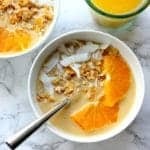 granola is one of my favorite smoothie bowl toppings. Yum! Omg! It looks so yummy! I’m definitely trying this one! Ooh boy, I LOVE Nature’s Path cereals. 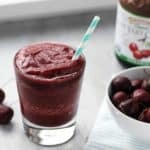 My favorite smoothie topping would have to be granola or nut butter and nuts. 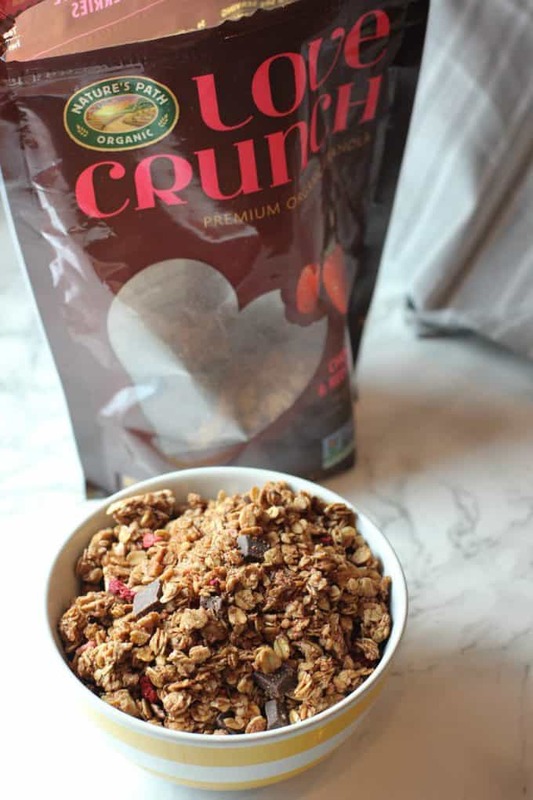 I’m obsessed with the love crunch granola, but you just took it to a whole new level!! This looks amazing! Chocolate and strawberries are 2 of my favorite things together! This looks SOOO good! I just bought a ton of strawberries cause they were on sale! This looks yummy! Especially those toppings. This looks so good! I love smoothie bowls!